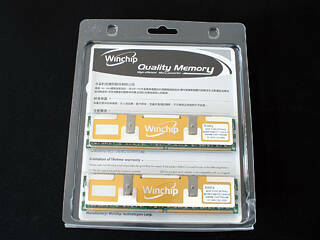 Winchip was founded in 1995 and has been a large player in the asian OEM market from the beginning. They have been pushing their retail offerings quite successful, with unique DDR2 and now DDR3 memory. The next goal of Winchip is to gain share on the European market with their retail products. They made some waves with their 1200 MHz DDR2 memory in combination with a large array of various heatspreaders as well as being one of the first to offer DDR3 for the retail market. Today we get to look at another very unique offering from Winchip. 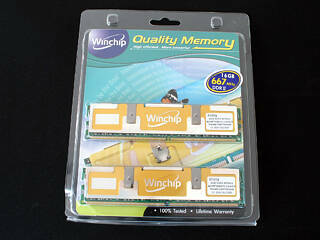 A 16 GB DDR2 Kit. It is made up of 4x 4 GB DIMMs each running at 667 MHz CL5-5-5-15. This may not seem like much, but the large capacity is the more important factor with such a kit. The memory ships in a blister pack. At first you may wonder, as only two DIMMs are visible. The other two have been placed in the rear of the package. While this means that the fact that this is a four piece kit is not conveyed to someone just browsing a store shelf, the large 16 GB capacity sticker should make up for that.